What calls you to this path? What are your hopes and expectations? Previous experience of spiritual practice, or witchywork? There will be a module to complete at home before the introductory workshop. Location: the Full Circle yurt space, near Exeter, Devon. Postcode EX5 3JN. Full directions will be given upon booking. The Way of the Witch year-long initiatory journey offers women a safe, sacred space to step through the doorway of the prosaic into a world rich with symbolism & meaning. The course is for women who already see themselves as witches, as well as those who don’t. It is open to all women and not any faith or religion specific, rather an eclectic collection of spiritual teachings and core beliefs to be shared, discussed and considered. Topics covered revolve around the 4 seasons, incorporating the 4 directions, elements, states of being. We also honour the sacred days, or witches sabbaths – namely the solstices, equinoxes & cross-quarter festivals. The aim is to enable women to step into their powerful wholeness, embracing the shadow as well as the light, the wounded as well as the healer. This could sound contradictory, but by being able to hold the all of who we are there is great power, and from here the manifestation of will, or magic is a step away. 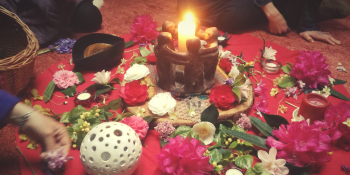 Together we hold sacred space, conduct ritual & ceremony, weaving story alongside sharing about plants & animals, the tides of the moon and the subtle energies of creation. Deepening self-awareness and powers of perception we cultivate divination techniques and how these can be a tool for understanding the evolution of the soul. Together we journey through the cycles of womanhood, maiden, mother, matriarch and crone, and all the stages in between, embracing the cycles of life through rites of passage experiences. The year course runs over a 12 months period, on the second Saturday of the month 10.30am – 5.30pm. Near Exeter, Devon. Starting March 2019. Attending an introductory day before booking is essential. Cost for full year training: £650 with a 50% non-refundable deposit to secure your place, with the remainder payable two weeks before course starts. Ask if you need to pay by instalments.